In the Sarasota area, you can enjoy the breathtaking sunsets, educational museums, operas, ballets, plays, golf tournaments, and boat races. You can join in tennis, lawn bowling, water skiing, shell collecting, bird watching, growing exotic tropical plants, university classes, golf, or boating. Quality service is available from knowledgeable physicians, bankers, lawyers, investment brokers, lenders and insurance agents, who can help answer your questions about living and conducting business in Florida. Sarasota, together with its neighbors to the north and south, Manatee County and Charlotte County, form the 7th-largest market in Florida. It is also Florida’s third-fastest growing major market. With over 600,000 people, the Sarasota/Manatee/Charlotte area is one of the largest, most affluent markets in Florida. In the last 5 years, it has grown 4 times faster than the national average. The per capita retail sales are almost 20% above the national average. It has a strong base of retirement age people, about a third of the population, but the fastest-growing segment of the market is middle-aged adults and their children. It has approximately 1/4 the population of the Tampa/St. Petersburg area. The beauty of Sarasota will get your attention on your first visit. 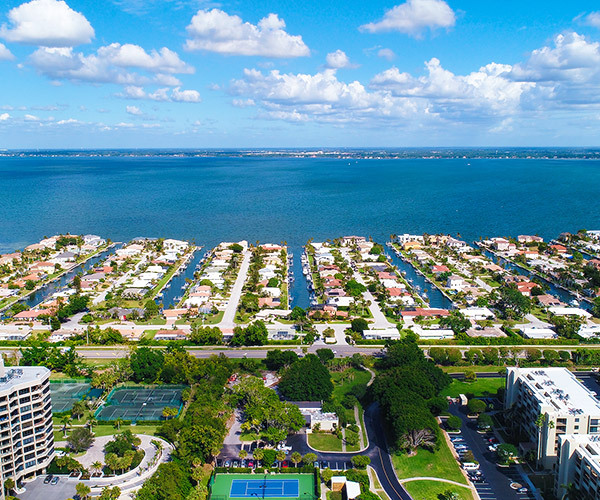 If you see Sarasota first from the window of an airplane, the colors of the Gulf of Mexico and Sarasota Bay, contrasting with the brilliant white sand of Longboat, Lido, and Siesta beaches, will make you anxious to see more. A rainbow of colors comes from the tall condominiums shining in the sun, the warm tile on the roof and patio of the mansion built by circus magnate John Ringling, the various green hues from the lush jungle-like vegetation, the flowers that are blooming any month of the year, and the lavender seashell-design Van Wezel Performing Arts Hall. Sarasota boasts some of the oldest and newest homes in the area. Some homes were built over 50 years ago as winter vacation cottages. Others are new gated bayfront estates with manicured grounds, marble foyers, soaring ceilings, the newest fixtures and technological advances, and spectacular views.